April 27, 2017 Robert W.
Las Vegas fast sign company can make you that custom sign or banner in a hurry. many times people, companies and vendors need fast signs and fast banners for a variety of reasons. If this is the case, Las Vegas has many fast sign companies that can custom make your banners and signs in a hurry. Technology has changed the sign industry. Large format printers are the key tool in the sign makers arsenal. These large format printers print very fast and with excellent quality. Many of the newer models have 8 colors instead of the traditional 4 color ( cmyk) inks. The additional colors make the printer have the capability of printing a wider spectrum of colors. Printing logos and pictures on banners and vinyl is no problem with these large printers. These printers are capable of printing several hundred square feet of print every hour with amazing quality. Las Vegas fast sign company is also very good for the trade shows and conventions. The big three convention venues ( Sands Expo, Las Vegas Convention Center, Mandalay Bay Convention Center) need many fast signs and banners for the conventions because often the people attending these conventions lose or damage their signs before the show. In addition, many times the signs and banners need to be upgraded to reflect changes in marketing strategy. There is a whole sign industry in Las Vegas dedicated to helping trade shows and conventions. These shops are often located near the convention corridor and offer delivery service to the convention sites as a means of assisting those people who find themselves at the convention venues without transportation. 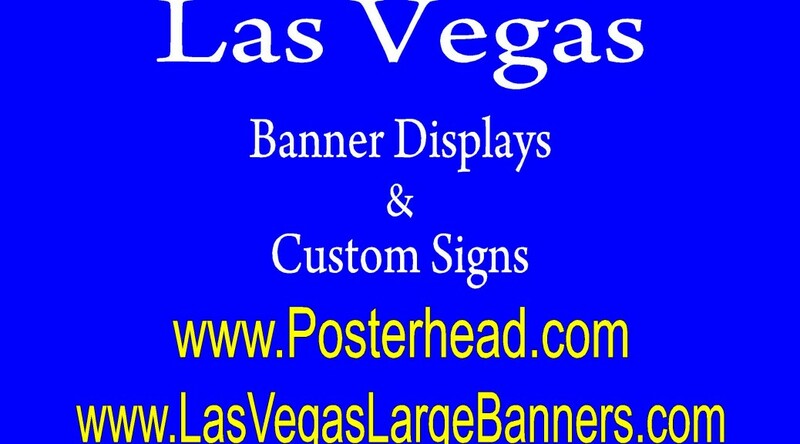 Las Vegas fast sign company can be found by searching the internet or through the local yellow pages in Las Vegas. See how these professional sign shops an assist you with fast display graphics. Vegas trade show fast sign printing is needed at trade shows and conventions when things go wrong and you need signs and banners replaced in a hurry. After months of planning for a trade show or convention, many people find themselves in need of last minute signs for the shows. This is because their graphics were lost or possibly damaged while being shipped to Las Vegas. This is why many businesses prefer to have display graphics made here in Las Vegas rather than risk damage in being shipped. Las Vegas is the “Grand Daddy’ of the convention and trade show industry. More trade shows and conventions are held in Las Vegas than any other place in the world. Everybody loves to have their trade shows here because in addition to having state of the art venues, there is so much fun to be in Vegas. Vegas’s motto is ” What Happens In Las Vegas, Stays in Las Vegas”. With gambling, 24 hour entertainment, top dining facilities, exquisite hotel accommodations, it all adds up to fun. There are many sign shops that can assist you in making those last minute banners and signs. Since Las Vegas has so many conventions and trade shows, many sign shops cater exclusively to the convention industry. These sign shops are located near the Las Vegas corridor and can make fast signs and fast banners to accommodate the needs of vendors at the trade shows at very reasonable prices. Large format printers can print at very fast speeds up to a couple of hundred sq. ft. per hour and more. Vegas trade show fast sign printing is available at most sign shops in the Las Vegas area. Use Yelp or Google to look at the sign shops reputations to help determine if you have the right sign shop that can do the printing fast. April 23, 2017 Robert W.
Las Vegas Yelp fast signs and banners is an excellent choice for a referral site if you are looking for signs and banners in a hurry. Yelp is a San Francisco based company that has a website for online reviews of businesses. Millions of people have left reviews on Yelp for local businesses and millions of people have used Yelp ( www.Yelp.com) as a source for determining if a business is best for them. Yelp allows for the average person to rate their experience of a business they used by different criteria. Some of that criteria includes, cost, performance, product, attitude and overall satisfaction of the experience at that business. People get to rate their experience on a 5 star system, where 1 star being poor and 5 stars being great. Along with this rating system, the user also gets to write a little something about their experience for others to read. The business gets to respond to the customer’s response in order to explain their version of events if it is a bad review. Its sad, but some people will try to write an article and rate a business in an attempt to extort something from the business. These people can usually be identified by consistent negative reviews on their profile. Las Vegas Nevada Fast Sign Printing. April 22, 2017 Robert W.
Las Vegas Nevada fast sign printing can get you those desperately needed signs and banners very quickly if needed. There are a variety of reasons that signs and vinyl banners need to be printed very quickly. The most common reasons are that the signs were damaged or lost and need replacing. For example, Las Vegas recently underwent a wind storm that lasted a few days where gusts of wind were up to 60mph. As a result, many banners blew off buildings and many signs were simply destroyed in the unusual high winds. Las Vegas Nevada Fast Sign printing is also great for the thousands of businesses who come annually to the trade shows and conventions in Las Vegas. With Las Vegas being the number one destination for trade shows and conventions in the worlds ( with millions of square feet of floor display space available) , many businesses plan a long time for their big opportunity to showcase their goods and services to the thousands of merchants and customers. However, many times these businesses find they arrive in Las Vegas but somehow their graphics get lost or damaged and need quick replacing so that the show can go on. If this is the case, Las Vegas has many sign and banner companies that can assist you in replacing your lost or damaged graphics in a hurry. They can also help you replace graphics if there is a change in last minute marketing strategy. Since there are many sign shops in Las Vegas that want your business, you will not be charged a “high price” for your last minute sign printing as everybody is competing for your business. In fact, many companies prefer to have their display graphics for the conventions and trade shows printed in Las Vegas rather than be shipped in. Las Vegas Rush Sign Printing. April 21, 2017 Robert W.
Las Vegas rush sign printing can help save the day when you need a sign really fast in Las Vegas. Many times signs get damaged or lost and need replacing and if that’s the case, Las Vegas has many sign shops that can help you with rush order signage. Local businesses are not the only ones that need Las Vegas rush sign printing. Many entertainers come to Las Vegas for shows and performances and need signage to promote their venues. Sports teams during the NCAA Basketball Tournaments and college football teams during Bowl season also need fast signage for their events. Of course, with Las Vegas being the number one destination for trade shows, Las Vegas rush order printing in always needed for the trade shows. Many times businesses will come into Las Vegas for the trade shows after months of planning and find out that their display graphics are not available because the shipping company was unable to get the graphics to Las Vegas in time. This happens all too frequently and fortunately, there are sign companies in Las Vegas that cater to this niche. Many of these shops are located near the Las Vegas Convention corridor so that they can be close to the action of the trade shows. Many times you can use sign review sites like Yelp or Google Business Reviews to help determine if the sign shop is the right shop for you. Then it is just a matter of a simple telephone call to get you help in finding the right sign shop. Since Las Vegas has many sign shops, competition for your business is fierce and the sign shops will compete hard for your business and give you the best service and prices. Contact the local sign shops to see how they can help you with your signage. April 20, 2017 Robert W.
Fast dust control permit signs are available in Clark County Nevada. Every so often, for one reason or another, a construction company needs a fast dust control permit signs because they forgot or there sign was damaged and the Clark County Air Quality Inspectors are threatening to shut down the construction sign until your are in compliance. Construction companies in Clark County are required to comply with the rules and regulations of the Air Quality Management Control Board. ( http://www.clarkcountynv.gov/airquality/Pages/default.aspx ) Dust control permit signs are required for construction projects in Clark County. For 10acres or less, a 4ft x 4ft dust permit sign is required and for construction projects larger than 10 acres, a 4ft x 8ft dust control sign is required. Certain information is also mandatory on the sign such as the project name, contractor’s name. contact information, size in acreage of the project and expiration date of the permit. Operating without this permit puts you in jeopardy with the Air quality Board and fines and other punishment could be applied to you and your construction project. Fast dust control permit signs are sometimes necessary to get legal with the County. If this is the case, same day dust sings are available in the Las Vegas area at sign shops. Usually, the sign shops make the dust permit signs out of a double sided aluminum panel that prevents rusting. This aluminum panel sign is tough and durable and much lighter than the old MDO wood signs that dust control signs were made out of. Construction people like the lighter dust control signs because only 1 person is necessary to put up the signs instead of 2 people that is required wit the much heavier MDO wood sign. Fast Dust Control permit signs are available at many fine sign shops in the Las Vegas area and can be made the same day. April 19, 2017 Robert W.
Vegas fast retractable banner stands are available in the Las Vegas area at very reasonable pricing. Vegas fast retractable banner stands are needed very frequently for the conventions and trade shows for which Las Vegas is known for. In fact, Las Vegas is the number one “Hot Spot” to hold your convention or trade show because of all the amenities that Las Vegas offers. Las Vegas is a 24 hour town year round. The weather allows for outdoor activities most of the year and people attending the trade shows and conventions enjoy the golf, hiking and boating that Las Vegas has to offer. Throw in 24 hour gambling, drinking, top entertainment, fine dining and other activities, its no wonder that Las Vegas is the top destination for trade shows and conventions in the world. Banner stands, also known as vertical banner stands, are a major component in the marketing strategy of businesses attending the shows. Banner stands are a wonderful graphic display that can hold a lot of information to display to the customer while taking up very little space. When placed together, they can look like one solid graphic that makes for a very impressive display. Vegas fast retractable banner stands are not expensive. The most common size is the 33″ x 78″ banner stand( which comes with its own carrying case) and with a print, costs less than $100 at most sign and banner shops in the Las Vegas area. These Vegas fast retractable banner stands can be printed the same day when needed as often people attending the trade shows and conventions find their graphics damaged or lost and need same day replacing. Vegas fast retractable banners are available at most sign and banner shops in the Las Vegas area. Using websites like Yelp and Google Business Reviews will help you know more about their reputation. April 17, 2017 Robert W.
Henderson Nevada fast banner printing is available in the Henderson Nevada area. Sometimes signs and banners are needed quickly in Henderson and there are many sign and banner shops in the area that want to be of service to you and your company. Many Henderson businesses are learning the value of advertising with vinyl banners. Low cost vinyl banners are a most excellent way to advertise to customers on a very economical way. Businesses and stores are learning that by putting a banner on their building or structure that can be seen by the vehicle traffic passing by will get results. This is especially true of the business is located adjacent to the freeway, (such as the 215 or 95). This is because thousands of vehicles use these freeways daily and your advertising banner than can be seen by these thousands of people every day. Many stores change these banners quite frequently so that their marketing is always fresh. it is like a billboard, but without the high costs and rent. Large format printers make banner printing very easy and fast. The large modern printers can print several hundred square feet per hour in all colors with amazing clarity. These large format printers can also print pictures, logos and other items with great clarity. All this modernization of the sign making printer mounts to a more cost effective printing system that has allowed for prices to decrease over the last several years. Where vinyl banners were once $5.00 a square foot, they have been lowered to a price of around $2.00 a square foot and can be printed more expeditiously than ever before. Henderson Nevada fast banner printing can be found at sign and banner shops in the Henderson area along with the adjoining Las Vegas area at very reasonable rates. See how banners can help your business. April 16, 2017 Robert W.
Vegas Fast Banner printing is sometimes necessary and available in the Las Vegas area at certain sign and banner shops. Las Vegas is a growing community and therefore many businesses are always being added in Las Vegas and in the surrounding areas. Because of the winds, many times the signs and banners that are currently being used by the stores and businesses get damaged during wind storms. if this is the case, these banners need to be replaced quickly in order to keep up the advertisement. While there are many sign shops that advertise vinyl banners, not all these sign shops are created the same. many sign shops do not have their own sign making equipment and rely upon other sign shops to do their printing. Modern sign shops use large format printers to print vinyl banners quickly and efficiently. The cost of making these vinyl banners has actually gone down in recent years because of the advancements in printing technology. Therefore, by printing faster and at less cost, sign shops can pass these savings on to their customers. Currently in Las Vegas, sign shops seem to be charging about $2.00 a square foot for printing a full color vinyl banner. ( Full color means that you can have as many colors as you want on the banners, including people’s pictures and logos) These banners are printed on a 13 ounce vinyl banner material with eco solvent ink ( inks specifically designed to withstand the long summer months and heat that Las Vegas has). As part of the banner printing, grommets and hemming is included in the cost of the vinyl banners. 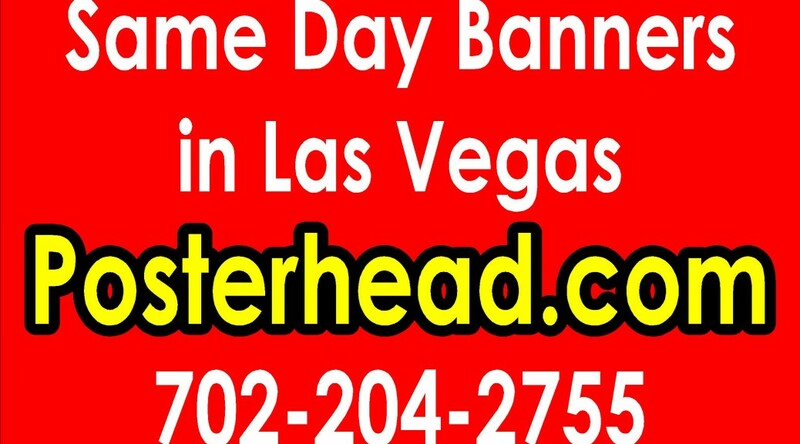 Vegas fast banner printing is available at many sign and banner shops in the Las Vegas area. Using Yelp or Google Business reviews is another way of helping choose the right sign shop. Fast 24 hour Las Vegas print banner stands are available in the Las Vegas area in short notice. Many times, for a variety of reasons, banner stands need to be made within a short period of time. This is especially true for Las Vegas conventions and trade shows. Often, banner stands and other display graphics get lost or damaged and need immediate replacing so that the convention can go on as planned. Nothing is more frustrating than planning a trade show or convention for months and then having something as simple as your display graphics being lost while in shipping and the shipping company is unable to locate your graphics. 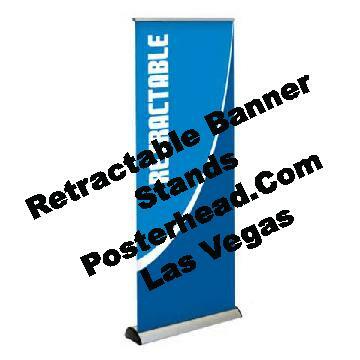 Fast 24 hour Las Vegas banner stands come in a variety of sizes. The most common sizes are the 33″ and 36″ banner stand. However, these banner stands come in 24″, 31″, 4″,48″ and 60 ” widths to accommodate display graphic needs. The best of the banner stands have an adjustable pole that allows for height adjustment of the banner so that it fits just perfectly and displays without flaws. The most common substrate is the 13 ounce banner material that allows for a long lasting graphic. The banner stand prints are printed with large format printers that can print with amazing color and clarity, including logos and pictures. The more modern printers are using 8 colors to print the banner instead of the traditional cmyk colors ( black, blue, red and yellow). Fast 24 hour Las Vegas print banner stands are not necessarily expensive. Las Vegas sign and banner shops routinely sell these stands for under $100.00. A slight premium may apply if it is a same day order and other prints have to be delayed and overtime needs to be paid to accommodate the last minute print. Fast 24 hour Las Vegas print banner stands can be found at sign and banner shops in the Las Vegas area.